Jim Henson directed Labyrinth (1986) is a classic film in many regards and a childhood favorite of mine too. Here is a fun facts list of things you probably did not know about Labyrinth. Brian Froud’s books which are the core inspirations for the creatures and world in Labyrinth were forgotten to be included from the scene with the tracking shot introducing Jennifer Connelly’s Sarah inspiration for the characters in the film. Jim Henson simply forgot to include Froud’s books. Merlin, the dog, was cast as a sheep dog for the fact that they needed to create a puppet version of him later for many of the more intricate shots later in the film. During the "Magic Dance" sequence, 48 puppets with about 52 to 53 puppeteers, plus 8-12 smaller actors on set. All of the baby crying sounds during the "Magic Dance" sequence were made by David Bowie. The baby hired to scream just would not so Bowie did it himself. 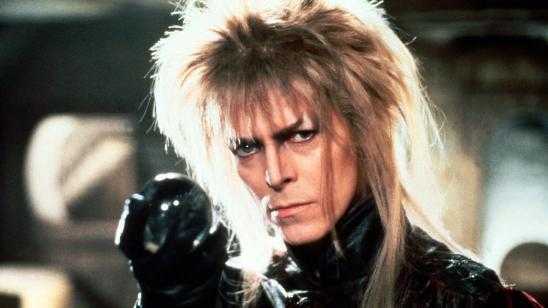 David Bowie was the main pick for the role of Goblin King Jareth, but Michael Jackson and Sting were also in the running. The Magic Balls that Jareth (Bowie) is making tricks with is motion captured by professional Michael Motion with scenes featuring Michael Motion simply hiding behind Bowie. Those hands are Michael Motion’s with David Bowie in the spotlight, absolutely no CG. Hoggle, played by Shari Weiser, was a hybrid puppet and actor costume. His face was operated by eighteen motors operated by four puppeteers by radio control. Company Industrial Light and Magic was used to create the opening sequence featuring the owl flying. The owl was one of the first totally realized CG created creatures in filming history. Toby was originally supposed to be on top of a very high ledge in the Labyrinth scene, but the parents declined to have their child that high. Jim Henson assured them that someone would be holding him atop there and if he did fall, someone would be waiting to catch him on the bottom. They still declined and instead, he is sitting on a very small platform with "movie-magic" showing him looking down into a very high landscape. Official Synopsis: The teenager Sarah is forced by her father and her stepmother to babysit her baby brother Toby while they are outside home. Toby does not stop crying and Sarah wishes that her brother be taken by the Goblin King. Out of the blue, Toby stops crying and when Sarah looks for him in the cradle, she learns that her wish was granted and the Goblin King Jareth has taken him to his castle in the Goblin City in the middle of a labyrinth. Sarah repents and asks Jareth to give Toby back; but the Goblin King tells her that she has to rescue her brother before midnight, otherwise Toby will be turned into a goblin. Soon Sarah teams up with the coward goblin Hoggle, the beast Ludo and the knight Didymus and his dog Ambrosius in her journey. Will they rescue Toby in time?